Someone over at Silent Hill Community posted this article concerning why Book of Memories is a good direction for a single game in the series. For what it's worth, I fully agree with it. I'd love to see the Silent Hill series be a think tank for psychological/horror-themed games that isn't chained by trying to be the exact same experience as before. I agree, and it annoys me that there are so many people outraged by the idea of breaking the mold. It's been really great to see the article resonate with so many people- very gratifying to find a milder portion of the fanbase who share the same optimism for the future of the series. One thing keeps cropping up though, and that's whether BOM is canonical or not. Can anyone clarify this? I'm struggling to find anything definite. Last edited by DirtyNorris on 03 May 2012, edited 1 time in total. I read the article and I agree with the fact that the main ingredient of Silent Hill's success is innovation. However, the basis of the reasoning fails at one point. The reason why many fans are against BoM is not the radical innovation that lacks the "main SH formula". That is the core of the rejection. And it's the first time it happened. People, aware of the mistakes Origins and Homecoming committed, finally understood that there is no place for blatant duplication nor revitalisation in the Silent Hill series. I don't deny that fans are whining about the multiplayer and the new "Sims" look BoM assumed. However, as much as that's the "troublesome" innovative factor, so much troublesome is the traditional atmosphere they refer to. I mean, great: the multiplayer aspect, from this point of view, is a pro. But it's like the total innovative and passionate inspiration that this article refers to is in fact confined by a fear of reception, therefore, it's like almost as a compromise they inserted the revitalisation aspect: "Hey! Maybe if we stuff in a bunch of nurses, Pyramid Heads, old music and rusty walls the fans might not notice the new multiplayer customization design we've applied!" It seems the game is going to be a spin-off. You have a good point. Personally though, I didn't feel the outrage against the returning monsters like I did for 0rigins and Homecoming, because it doesn't feel like a thoughtless inclusion this time. Before it felt like the lying figures and nurses and Pyramid Head returned because the developers thought that was what was necessary to make Silent Hill *Silent Hill*. It's clear they recognized they made a mistake; thus we've had new monsters for the last two games, and Tomm explaining Pyramid Head's exclusivity to James every other interview he's in. I don' t know...this time around, and with BOM being the closest to a spin off title since the arcade title, it feels like the rules are different. You present a very legitimate reason to dislike the game on principle but...I don't know. The return of old creatures seems like a very deliberate decision. Like with Shattered Memories' "reimagining" of SH1 being developed with the anniversary of the game in mind, it's probable BOM's story of rewriting your past ties in with the reappearance of SH's past. Whether you agree with the decision to do this or not, it seems the decision had much more significance than when it was made for 0rigins and Homecoming. We'll just have to see if the plot holds up. Also- Jesus, it does look like the Sims doesn't it!? I used to play the (surprisingly great) GBA versions of Bustin Out and Urbz and...graphically, BOM looks pretty similar. The things you've said couldn't be further from the truth, but it's clear there's nothing else I can do to prove that to you. Just like fans saying "Downpour looks stupid I bet Pyramid Head is in it" after 2 years of me saying Pyramid Head wouldn't be in it. Uh, Tom, mikefile wasn't hating on the game, he was just explaining why other fans are having a (justified or unjustified) dim view of the game. He's personally excited for it. Your post wasn't entirely appropriate, and kiiind of disrespectful. I disagree that fans in general are finally understanding that. For Book of Memories, yes; it's not traditional survival horror, it uses old creatures, and it's multiplayer. But considering the prevalence of people who still think TEAM SILENT WAS THE BEST BRING BACK TEAM SILENT THIS IS NOTHING LIKE TEAM SILENT, I don't think that fans as a whole know that using the same Otherworld is repetitive. There's a difference between being defensive and negating all perceived criticism from the other person by rewriting their post to literally read "hatehatehate." If mikefile WERE criticizing the game, Tomm's response would've made such a fan feel justified in their "the new devs don't care about the series or the fandom at all!" mentality. How does the game feature 'old music'? Or are you talking about Love Psalm, which sounds pretty much nothing like the original version? Because the game's soundtrack is (imo) one of the most interesting and impressive in the series. As the game's lead designer and director, I can assure you we didn't just 'stuff in' a bunch of old SH elements for kicks, or out of fear, or fan backlash, or compromise. The game is very thought-out, and every element in it (new and old) was specifically included because the game would be better for it. There was no 180 during development - Tomm and I knew the kind of game we wanted to make, we made it, and the end result is really pretty damn cool. I can understand peoples' skepticism. But stick with us and keep an open mind. This is a game for SH fans by SH fans. I certainly look forward to it, for one. I'm going in with quite low expectations--just because it looks to be a game like Gauntlet Legends, which I liked--but if it does more than just provide me with a fun time, that'll be fantastic. I disagree that fans in general are finally understanding that. Unfortunately, you're right. I was rather sharing my opinion based on what I've been reading for the last few months. Fans, in general, didn't understand that. But a several number of people did. But considering the prevalence of people who still think TEAM SILENT WAS THE BEST BRING BACK TEAM SILENT THIS IS NOTHING LIKE TEAM SILENT, I don't think that fans as a whole know that using the same Otherworld is repetitive. Unfortunately again, that is the true reason of what the fans (in general) understood. It's not so much that bothers them the fact that the new game will be less good for revitalising some elder components into new ones. The problem most people have is that the new game would not be as perfect as their precious 'Team Silent games', or even the fact that it ruins their memories of the first games, which is even more dumb. How does the game feature 'old music'? (...) a â€œmacabre celebration of the best the series has to offerâ€ that revisits beloved locations, creatures, and even music from past stories. As the game's lead designer and director, I can assure you we didn't just 'stuff in' a bunch of old SH elements for kicks, or out of fear, or fan backlash, or compromise. The game is very thought-out, and every element in it (new and old) was specifically included because the game would be better for it. And that's really great. I just don't see why are You implying that I have a personal issue with the game. I didn't even describe any personal judgement in my previous posts. I was just explaining the usual problem among this fandom. I must say that I wasn't expecting such a response. Except the complete misinterpretation that You extracted from something that was nothing else but an objective comment about the fans' viewpoints, taking my comment and editing it by inserting eleven lines of 'hatehatehate' was something disrespectful. With all due respect, this kind of flaming is very offensive. Unfortunately, Adam, I believe many of the people that were quick to vocalize their disapproval of the game have heard such promises before. That is obviously unfair, as you are a completely different dev team with very different goals and ideas when it comes to this title. However, I think there are certainly some parts of the player base that have been reassured with every title after SH4 that the people working on the new game are fans of the source material and they're making it for fans, only to feel "burned" by their time with it. That's not to say I think that the title you've all created should be judged or is representative of anything that came prior to it, but I think that there are some people that will hear it and, no matter how true, will choose to think the contrary. I really hope this is a hit, though. I'm glad to see someone getting in there and shaking things up a bit. Actually, now that you mention them- what the hell happened to all those casual fans? I don't think it'll kill the series....i don't like the gaming mechanics behind it or the fact that it has other characters nightmarish creatures all in one game, but as long as this doesn't find it's way into the original universe i'm happy. And that is only because i don't think they'll actually find a logical way to explain this to fit the series canon. I think the game fits it's purpose soley as a fun multiplayer romp...but it certain;y won't kill the series. It's a spinoff game for a handheld system. Anybody who thinks it will single handedly kill the series and/or will trigger the Book of Memories gameplay to be incorporated into every single SH game from here on out is a moron plain and simple. Strong words, but I refuse to be polite about absent mindedness. Exactly where does this notion come from? It seems to be one of the most prevalent complaints of SH fans game-to-game, that they reuse creatures like Pyramidhead who 'belong' to specific protagonists like James. But where did it ever say that creatures were created specifically for each protagonist, rather than pre-existing and being 'cast' in the role of their torturer? 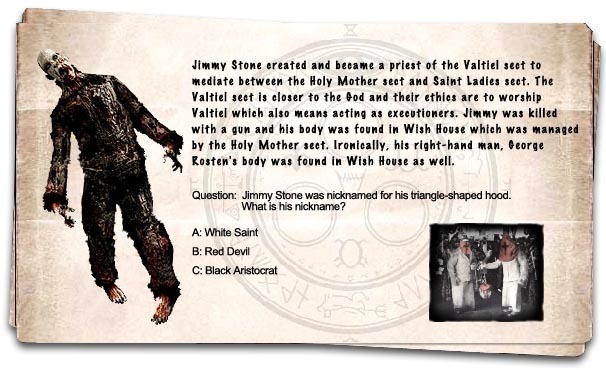 Doesn't Phead's appearance come from SH4's Jimmy Stone cult outfit? If so, what does that have to do with James Sunderland and his dead wife? And if creatures are specific to protagonists, why does everyone have such a canine fixation? They were all traumatized by RE1 when the dog burst through the window.